Human disturbance of tropical rainforests in Madagascar including wildfires, burning and timber exploitation, have led to reduced rainfall and a longer dry season, further pushing the already critically endangered Greater Bamboo Lemur to the brink of extinction. Auburn Professor Sarah Zohdy, along with primatologist and lemur expert, Patricia Chapple Wright of Stony Brook University, evolutionary biologist Jukka Jernvall of University of Helsinki in Finland and other colleagues published the new study titled “Feeding Ecology and Morphology Make a Bamboo Specialist Vulnerable to Climate Change,” in the Oct. 26 online edition of Current Biology. Researchers have evidence to suggest that, as the climate changes, Madagascar’s Great Bamboo Lemur will gradually be forced to eat culm, the woody trunk of the bamboo, for longer periods of time throughout the year. Based on an analysis of anatomical, behavioral, paleontological and climate data, they suggest that ultimately this dietary constraint will impact the Greater Bamboo Lemurs’ ability to thrive and reproduce and will shorten its lifespan. Zohdy, an assistant professor of disease ecology, along with Wright, a primatologist, anthropologist and conservationist, and colleagues including Jernvall and Stacey Tecot, associate anthropology professor at University of Arizona, first showed that the Greater Bamboo Lemurs are equipped with highly complex and specialized teeth, just as giant pandas are—the only other mammal capable of feeding on culm. Those teeth make it possible for them to consume and survive on woody culm for parts of the year. “Many animals are highly specialized in their diets and habitats, and this typically provides them with an evolutionary advantage,” Zohdy said. “However, it also makes them particularly vulnerable to any shifts in equilibrium, such as those brought on by climate change, which can throw off adaptations that have been evolving for millennia. 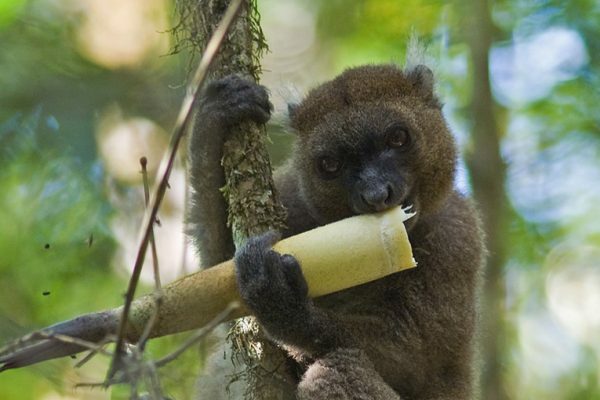 To find out more about the Greater Bamboo Lemurs’ feeding habits, the researchers spent hours watching them in their natural habitat in Madagascar’s Ranomafana National Park over a period of 18 months, collecting more than 2,000 feeding observations in all. Those data showed the lemurs spend 95 percent of their feeding time eating a single species of woody bamboo. But they only eat the culm from August to November, when dry conditions make tender shoots unavailable. “We think that this is what has driven the range contraction of the greater bamboo lemur, and why they can only be found in the places on the island of Madagascar where the dry season is the shortest,” Zohdy said. According to the research findings, Madagascar rainfalls are changing annually. Over the past two years, Wright says, there has been a three-month delay in the rainy season and new tender shoots that Great Bamboo Lemurs use for sustenance are appearing in January and February—14 days after the first rainfall. Since new offspring are born in November, the delayed rainy season is dangerously affecting the survival of the baby lemurs because of lack of nutrition available for both the mothers and offspring. A characteristic of bamboo-feeding mammals is that most are considered threatened by extinction. In Asia, both giant and red pandas have much diminished geographical ranges and similarly, in Madagascar, the two larger bamboo lemurs, the Greater Bamboo Lemur and the Golden Bamboo Lemur, have highly restricted distributions within the island. In fact, once the most broadly distributed lemur in existence, the Greater Bamboo Lemur is now one of the most critically endangered of all lemurs, with only an estimated 800 in the wild.